In a lecture titled “The Long March for Civil Rights in America,” scholar Robert Michael Franklin, Ph.D., will review the history of this struggle and illustrate the role of culture, interfaith religious cooperation and technology in establishing full civil rights for all Americans. The effort to provide full rights to all U.S. citizens involved a continuous struggle from the country’s founding until the 1960s when Martin Luther King, Jr. emerged as a symbol of the cause and those rights were, at long last, officially acknowledged. Presented through the University of New England’s Tangier Forum for Global Studies, the lecture will take place in the auditorium at UNE’s campus in Tangier, Morocco, on Thursday, March 24 at 7 PM local time (3 PM EST). The event will include a public reception in the academic lounge immediately following the lecture. In addition to welcoming a multicultural audience in Tangier, the lecture will be live-streamed to viewers around the world. Those watching remotely from UNE’s two Maine campuses and points elsewhere will have the opportunity to participate in the question-and-answer session following the formal portion of the lecture by submitting questions to Franklin through email and twitter on the live video webpage: [http://www.une.edu/calendar/2016/long-march-civil-rights-america. 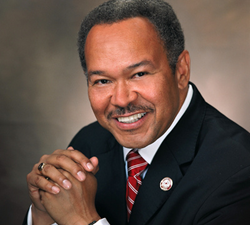 Franklin is president emeritus of Morehouse College, the United States’ only all-male historically black institution of higher learning, where he served as tenth president from 2007 to 2012. He is currently the James T. and Berta R. Laney Professor of Moral Leadership at Emory University and director of the Religion Department of the Chautauqua Institution. In 2014, he served as senior advisor for Community and Diversity at Emory. In 2013, he served as visiting scholar in residence at Stanford University’s Martin Luther King, Jr. Research and Education Institute. In addition to penning the foreword to Martin Luther King, Jr.’s Letter from Birmingham Jail, reprinted by Trinity Forum in 2012, Franklin is the author of three books: Crisis in the Village: Restoring Hope in African American Communities (2007); Another Day’s Journey: Black Churches Confronting the American Crisis (1997); and Liberating Visions: Human Fulfillment and Social Justice in African American Thought (1990). Capitalizing on the millennial legacy of Tangier as a border city open to new ideas, the University of New England Tangier Forum for Global Studies is designed to encourage discussion and critical examination of the burning issues facing the global community in the 21st century. American, Moroccan, and scholars from around the world give lectures and conduct seminars to shed light on histories and cultures that are critical to our knowledge. All events are open to the public and streamed live around the globe. The University of New England (UNE) is the largest private university in Maine, USA. It offers dozens of undergraduate, graduate and professional degree programs and is home to Maine’s only medical and dental schools. With coastal campuses in Portland and Biddeford, Maine, and Tangier, Morocco, UNE attracts internationally recognized scholars in the sciences, health, medicine and the humanities. It belongs to a select group of academic institutions with a comprehensive health education mission including programs in medicine, pharmacy, dental medicine, nursing and an array of allied health professions.